The Cast and Crew for Gina K. Designs welcomes you to day one of our blog hop celebrating the new stamp sets from the July StampTV release party! We hope you will be inspired by the beautiful card projects as you hop along to each of the designers' blogs. Today, we are featuring two stamp sets by Theresa Momber and Melanie Muenchinger. 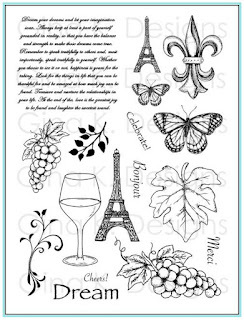 The first set is French Flair by Theresa Momber. Theresa has created this wonderful set that will leave you feeling like you are in Paris or strolling around the vineyards of Italy. The second set we are featuring is Stately Flowers 10 by Melanie Muenchinger. 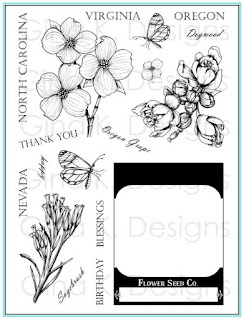 She has added this new set (#10) to her Stately Flowers collection. 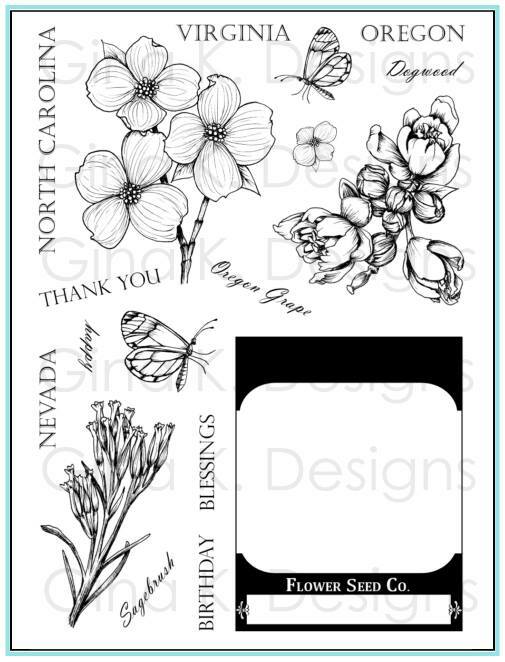 You will be able to use all of Melanie’s flower stamps to fill the seed packet in this set. Don't you think that's an adorable way to send the perfect little sentiment? Join me tomorrow for day two of our hop! 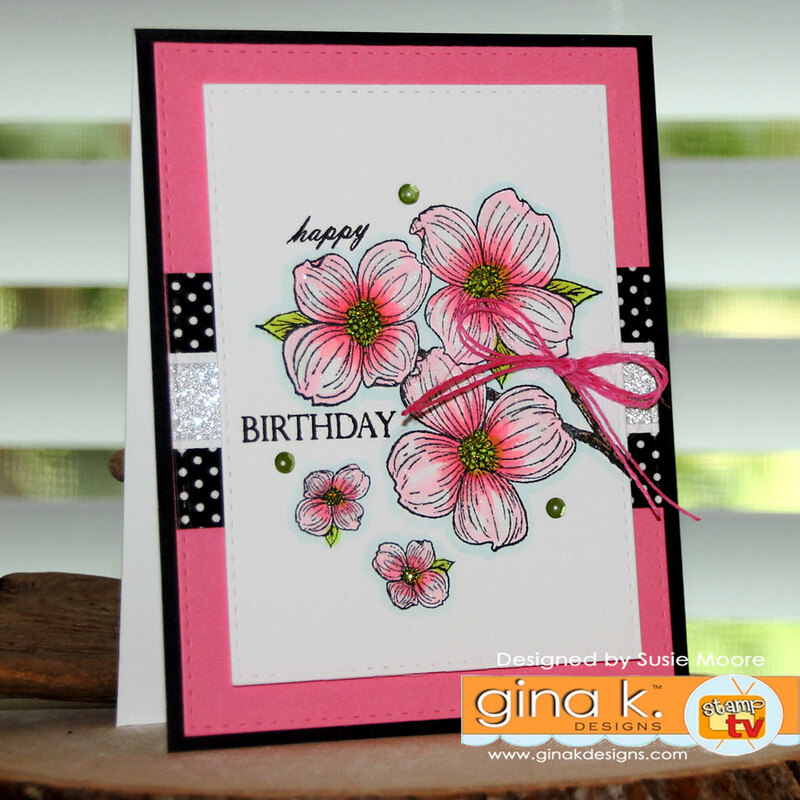 LOVE the masked butterfly design and this dogwood card is one of my faves! Perfect in its details, so joyful! Wow! Susie, your cards are both so striking. So bright and beautiful! The cards are so bright and beautiful - great designs! I love everything about both of your cards, thhey are stunning!! Your colors are so vibrant and cheery, just wonderful cards! Fabulous cards. I like how you colored the butterflies and the flowers. 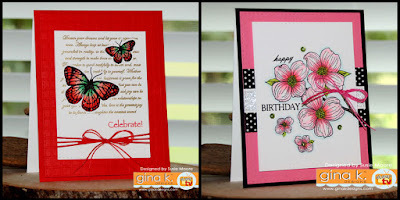 Gorgeous cards, The butterflies and flowers are one of my favorites! Love the butterfly card! 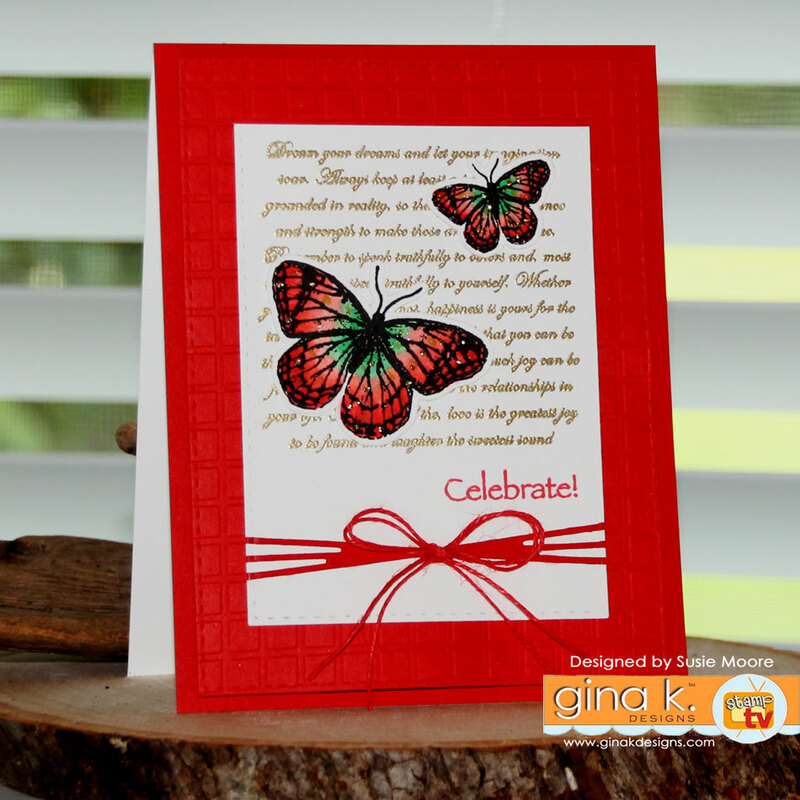 Those bright colors on the butterflies make the card so beautiful. Dogwoods are beautiful also. Love the vibrant colors you used. Both cards are very, very pretty. Thanks for sharing. The coloring on both cards is wonderful. Susie, The dogwoods almost look real. Thanks for showing us this card! IG and she always wow's me! Great cards! I love the masked butterflies! They are awesome! Love that first card! Makes me want that stamp set!!! Just beautiful. Love your colors in the second card. So pretty! You did a spectacular job on the coloration of the butterfly! The dogwoods are so warm and pretty. Thanks for 2 more ideas for my birthday card stash! I love both of these beautiful cards! Lovely cards and such great colors you used. Your butterflies are so colorful! Love your cards - the bright, bold colors are awesome. They would cheer anyone up! Thanks for sharing with us! Love both of these. I think the way you did the butterfly and flower colouring is stunning on both. Wonderful new sets and your cards are gorgeous too! Loving the colors of you cards! So beautiful! I love your sumptuous, deep, rich colors!!! What talent ♥ Thank you for sharing!!! Love the use of the butterflies and the flowers are beautiful. Gorgeous cards - I love them both! Such pretty and vibrant colors. Gorgeous! 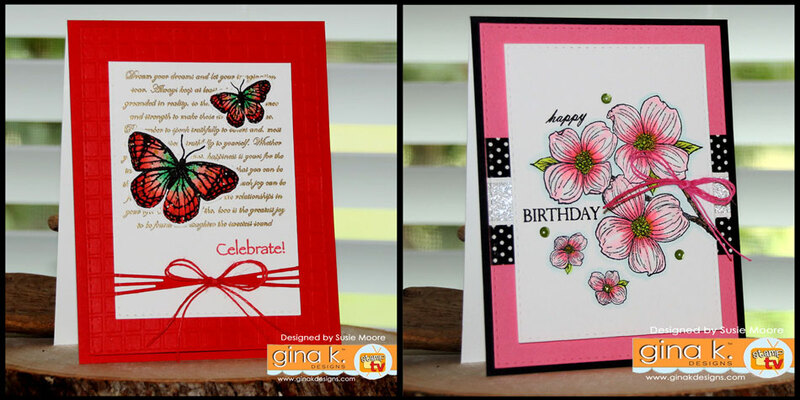 Both cards are just so pretty and love the bright colors you have chosen to use. Your coloring skill are amazing. Love all your attention to the details that went into making your cards. Thanks for sharing. Love, love, love your butterfly on red card. Gorgeous. Wonderful cards. I love how you did the butterfly card. Lovely cards! Thanks for the inspiration!! Wow!! Those butterflies pop off the cards and flowers colors and your layout is just perfect.Thanks! These cards are beautiful, I especially like the colors on the butterfly card, they really stand out! I love both of the cards with such beautiful colors. Thanks for sharing. Both are beautiful cards. I really like your twine bows on them. Great cards - such pretty colors and outstanding designs. 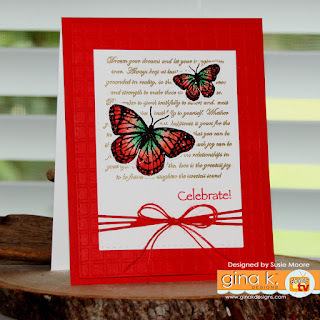 Both are lovely cards, but I just love the coloring and sparkle you used on those butterflies!